The Savannah Stompers Jazz Band (SSJB) is the pre-eminent and longest standing Dixieland/Traditional Jazz band in the area. We perform early 20th century classic jazz tunes from New Orleans Dixieland, to St.Louis and Chicago jazz and the West Coast Revival (40's). We recreate the joyful and still popular music of the Jazz Age of the Roaring 20's, the "Great Gatsby" era of daring "flappers" & New Orleans Mardi Gras music which lends itself to all styles of dancing. So join the movement and enjoy original jazz, born in the south, and hire the SSJB for your special event. This is all fun FOOT-STOMPIN', TOE-TAPPIN', GOTTA GET UP AND DANCE MUSIC! If you want a rousing party your guests will never forget, the SSJB is your band. Our repertoire of everything from slow ballads to the original blues, up-beat Charlestons, two-steps and more, appeals to audiences of all ages. Our audiences are always compelled to leave their chairs and shake a leg to this infectious music. Our breakout quartet or quintet can play American Standard popular tunes for the more sedate cocktail hour segments of weddings or other events. You should look up what previous clients had to say about us in the testimonial section of our "profile". The Savannah Stompers have played on the Savannah Riverboats, at many historic downtown Savannah squares, private clubs, hotels and historic sites, public events, conventions, fund-raisers, class reunions, "Great Gatsby" themed parties, Mardi Gras Festivals and U.S. Tennis Association tournament parties & award ceremonies. We are particularly popular for wedding functions, in which case our SSJB pianist can perform classical processional/recessional selections chosen by the client ahead of time for the wedding ceremony. We can also play special requests from the popular commercial repertoire for the "First Dance" and family dances at wedding receptions. The SSJB is a 7 piece ensemble of Savannah area experienced musicians (trumpet,trombone, clarinet, tuba, banjo, drums, and piano/keyboard). Bob Paredi formed and leads the SSJB on TPT and vocals. We have been the featured band at the Coastal Jazz Association Valentine Day/Chinese New Year Concerts, and were also featured at the annual St. Simons Jazz In The Park Music Festival. Disney Films chose the SSJB , without our solicitation or audition, to perform and be filmed in the Miley Cyrus film, "The Last Song", released in April 2010. Subsequently we recorded and published our first studio recorded CD, "Emperor Norton's Hunch", available at most of our performances. To help you in choosing a band, by all means check the CONSISTENTLY OUTSTANDING TESTIMONIALS we have received from all of our clients. The Savannah Stompers were absolutely perfect for our wedding, and I can't recommend them enough. I've been to dozens of weddings, and have grown tired of the same old strings vs. DJ options that you typically see - if you want something classy AND upbeat/fun for your wedding, then look no further. Not only were these guys incredibly accommodating in taking a new song request for our dance, but they were flexible and friendly during the entire reception, and our guests loved them. 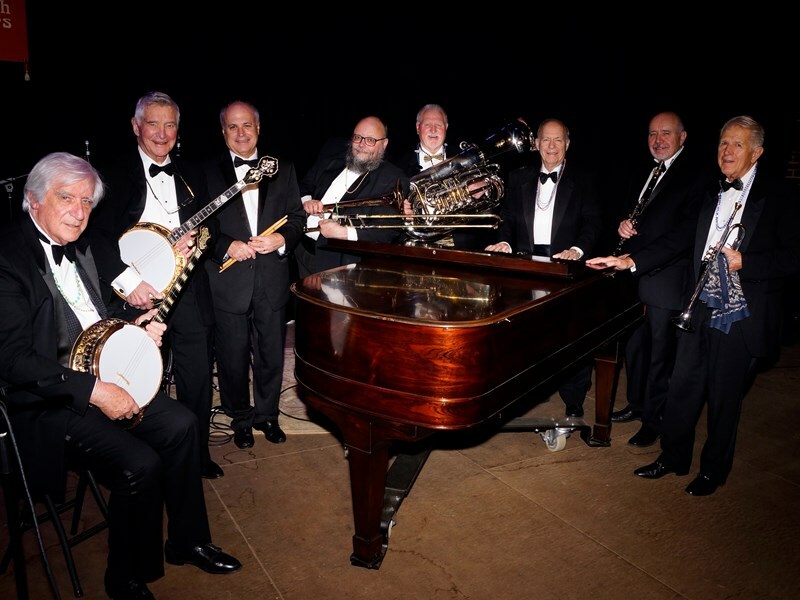 Bob and the boys are quite versatile and can easily go from playing beautiful standards to getting the crowd on the dance floor with some authentic N.O./Dixieland jazz. Book 'em! The band was amazing at our wedding ceremony as well as at our wedding party. They learned and played several songs which were very special to my wife and me. It meant a lot. Our guest had a blast dancing. The band exceeded the very high expectations we had. I cannot say enough about their performance! The Savannah Stompers were great! They learned our requests ahead of time, handled music perfectly during the wedding ceremony, and proved to be very flexible with everything involved. I would 100% recommend them for a wedding or any type of live event. Can't tell you how many times I heard, "the band is great" from those who attended the reception! Thanks! FABULOUS. The music was great and they keep everyone dancing. I had many compliments from my guests as well. Bob, Jeff and the entire band were amazing! They were very professional and accommodating during the entire planning process and at the event. They are amazing musicians and our guests loved them! They were perfect for our vintage Savannah wedding! Absolutely love these guys and would not hesitate to recommend them to anyone looking for great music for their event. The Savannah Stompers are true gentlemen! Savannah Stompers did a great job at my wedding this past weekend! We had planned a park ceremony with a parade, which the band was more than willing to do, but it rained and our plans changed at the last minute. Fortunately we had an indoor reception space, and the band was flexible in going with the back-up plan. The music sounded great, and our guests really enjoyed themselves! I definitely recommend them! Overall a very good experience - nice group of people to deal with who play fun music - got our parents out dancing. I seem to recall a very long dinner break, but other than that it was great. I think they may have even played a little bit longer than was expected. Thanks! Do You Know What It Means To..
Blues My Naughty Sweetie Gave..
and a hundred more, plus many "standards"
Please note Savannah Stompers Jazz Band will also travel to Eden, Pooler, Meldrim, Bloomingdale, Rincon, Hardeeville, Oliver, Guyton, Ellabell, Furman, Scotia, Statesboro, Fort Stewart, Daisy, Dover, Richmond Hill, Springfield, Bluffton, Pembroke, Hagan, Pulaski, Tybee Island, Bellville, Fleming, Gifford, Tillman, Hilton Head Island, Daufuskie Island, Clyo, Midway.